I picked up a couple of Calvin Williams singles recently. What can the SD faithful tell me about him? He's probably best-known to the Northern soul crowd for his tune, "Lonely You'll Be", originally issued on Northern Del-La out of Detroit and picked up by Atco. The song was also recorded by its producer, Johnnie Mae Matthews. 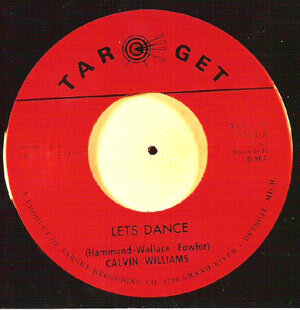 I think Calvin had another tune entitled "Let's Dance", think the label was Target. Never heard this one, not too big on the other (had an Atco WLP and traded it off). Thanks. Those are the two I've got(on Northern Del-La and Target). Oddly enough, both those singles have the same catalog number, T-501. I really like both those songs but the flips leave me cold. I did a Google search and at one point the Target single went for $350(I think) on Ebay but I was unable to find any more information about the sale on Ebay proper. Anyone know anything else about this guy? Calvin Williams had several 45s out on Johnnie Mae Matthews' labels in the late '60s. I can't go look them up until November. I think he wrote some songs used in the Matthews stable. Brian - I really like his Target 45, "Let's Dance." As well as the Northern Del La 45 he recorded as Lloyd Williams on the ART label - a song titled "Standing On The Sidelines." There's another Lloyd Wiliams' Detroit 45 on the Soul Beat label, titled "Be Mine Tonight." Graham, that Soul Beat single was issued nationally on ABC - produced, if I remember rightly, by ex-Sunliner Fred Saxon. Target single so we've all the info. in one place. I'll take care of that before work tomorrow. Time to head to the mines right now. Hey, are JuiceFree and I the only postal workers on this site or are there more? Stand up, disgruntled ones and be counted! Note that the catalog numbers are the same on both records. Davie, is that the info you needed? If you like, I can try to scan them at the library this week. I'd love to see a scan, and have the details of the flip side of the Target 45.
records and post a discography in a day or so. I think the Target label might have been a joint effort between Johnnie Mae Matthews and Sonny Marshall, as was the Northern De La label. I'd like to see a label scan as I also think the Target label uses more than one color, which was unusual for JMM. I can't quite make out the the number on Grand River. Don't cha just hate red labels with black print. Graham: the half circle at the bottom of T-501 reads: "a product of Target Recording Co. 8791 Grand River - Detroit, Mich"
Calvin Williams appears on the Funk Funky Detroit comp released by Funky Delicacies earlier this year. The song "Going and Get It (Bring It To You) is a pretty decent funk soul number...but it dosent really sound like the guy who did "Lonely You'll Be." Does anyone know the year of release for "Let's Dance" on Target and "Lonely You'll Be" on Northern Del-La?